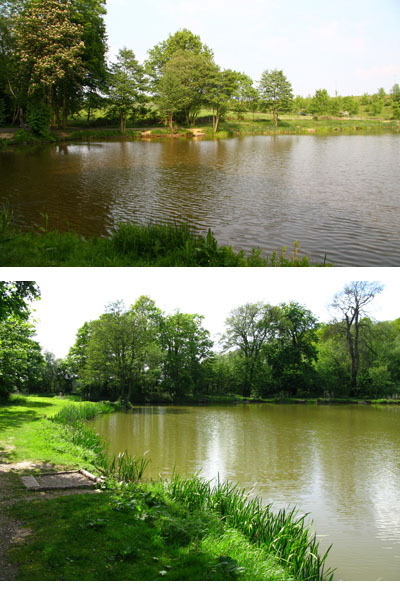 A Small pond with 30 pegs and situated close to the M1 motorway. Large stocks of fish include Roach, Rudd, Bream, Perch and Crucian Carp. Common and Mirror Carp to 20lbs are also present and many Fish fall to floating baits during the summer months. Depths range From 3ft on the Motorway side to 7ft on the woodside. There is ample Parking both at the bottom of the track and also in the small car park near the wood. A key is required. Members Only. Night Fishing is allowed (with night permit). No Closed Season, Open all year. From the A6002 Woodhouse Way Turn right at the traffic lights into Strelley Village. Follow the road through the Village past the Church on the Right. Approx 200 Metres past the Church there is a left turn onto a Bridleway, follow this track over the Motorway. The entrance to the pond Is on the left just over the bridge. Follow the track to the bottom of the hill.